Installed by the British in the early 1900s, the Zero Stone marks the exact geographic location of the city, and is one of 80 such stones installed by the British to mark the zero points for survey of the country. From this stone distances were measured to other Zero Stones in neighbouring cities and locations, most of which seem to have been located near the main post offices which were considered a central place. Pune’s Zero Stone is inscribed with the following locations; Poona, Bangalore, Sholapur, Ahmednagar, Nasik, Purandhar, Alandi, Sinhgad and Paud. The Zero Stone today seems to have a curious and precarious existence, leaning against the boundary wall of the GPO it’s become a useful storage spot for brooms and assorted items by the roadside tea vendors. There’s nothing to specifically highlight it’s existence or significance, a situation that led some years ago to the stone being half-buried under the pavement as a result of carelessness on the part of a civic contractor. It goes to show just how fragile some of India’s monuments can be. The stone that marks zero miles in a city is also called the ‘Golden Milestone’. It was the Romans who first created the concept, defining the centre of Imperial Rome with the ‘Milliarium Aureum’ or the ‘Golden Milestone’ in 20 BC. This 2.5m tall and 1.2m diameter marble cylinder marked the point from which the major Imperial highways radiated; the Via Aurelia, Via Appia and Via Flaminia. Ironically Rome’s own Zero Stone and even its exact location has since been lost, as road construction in the city in 1835 erased the monument. The principle of a single datum for a city was rediscovered with the great expansion of road building in the 20th century. In London it became a statue at Trafalgar Square, in Washington it’s just outside the White House. Luckily the precarious nature of Pune’s Zero Stone is getting some attention by local historians, in particular Mandar Lawate who has made efforts to raise its awareness to the Pune Municipal Corporation (PMC). Sadly in 2017 the PMC’s heritage cell executive engineer Harshada Shinde said that she was unaware of the significance of the Zero Stone. Although the Zero Stone lies outside the premises of the GPO, they too have been approached with ideas as to how the monument could be better preserved and recognised. This includes draft plans to build a small structure over the stone, with finely dressed basalt stone columns and pediments, and an associated plaque. Hopefully soon the Zero Stone will receive the recognition and strives towards preservation that it deserves. In a city that is ever changing and developing, this small humble stone leaning up against a wall is so vulnerable and could easily be lost forever. 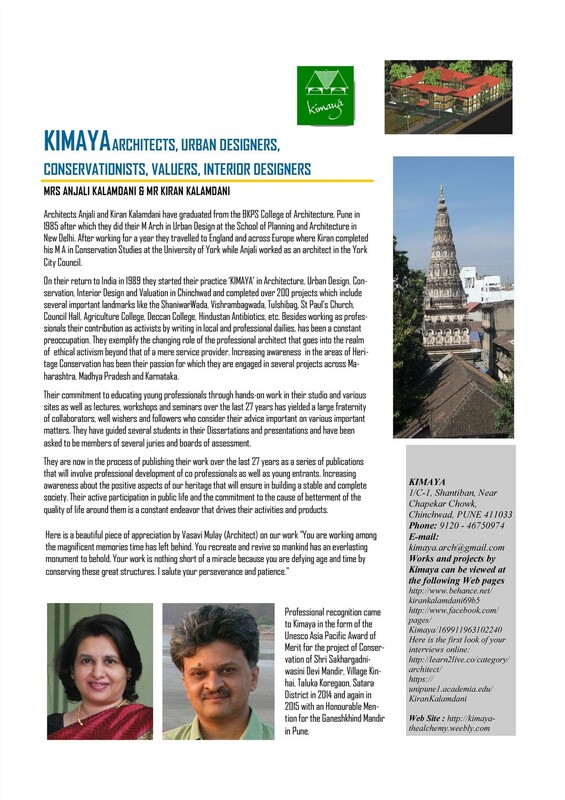 I was contacted this morning by Anjali and Kiran Kalamdani, who for almost 30 years have been architects, urban designers, and conservationists based in Pune. In 2014 they received an award from UNESCO Asia Pacific for their conservation work in the region, and it was fantastic news to wake up to. Their submitted plans for the protection and recognition of the Zero Stone were not only accepted, but work is well underway towards completing it. When I said work was underway, I wouldn’t be surprised if it’s completed in the next week or so. Here are some shots of the structure being produced. And better still, they are already on site ! These were taken right by the Zero Stone, as they make the finishing touches before erecting the structure. I returned to the Zero Stone early this year to see the results of the conservation work. Although I had seen pictures of the structure being erected, I was keen to see how all the efforts had turned out. At first glance I was quite encouraged, the stone is clearly now a landmark outside the GPO, and this should prevent it from any further dangers of neglect that at one time saw it half buried under the pavement. Lying discarded on the side of the road in front of the monument is the pediment, itself covered in what appears to be associated rubble that has been swept into a pile around it. As you can see from the above images taken in April last year, this pediment did make it to the site in one piece, but it now seems to be broken. What isn’t clear is whether the pediment was abandoned for whatever reason and just left on the side of the road, or whether it has been pushed off from the top of the structure. It would be quite difficult for this stone to end up where it is if it had been removed from the structure, there’s only a small gap in the metal fence directly in front of the monument, so getting the pediment to this position would be quite difficult. Perhaps someone who has been in the area in the last year could help shed some light on this mystery. A further disappointment to see was the efforts someone has made to highlight the words “Zero Stone” in what appears to be white paint. Not all the letters have been highlighted (or have some been cleaned? ), but whatever the case it’s completely unnecessary and doesn’t add any value whatsoever. I left the Zero Stone with mixed feelings. I was so looking forward to seeing the end result of all the efforts that have been made to recognise and conserve the monument, but equally disappointed that those efforts remain unfinished, and the stone has received further damage with the unnecessary application of paint. On balance I have to remain positive that at least something has been done, and this should prevent the Zero Stone from completely disappearing as a landmark in this rapidly growing city. Same here! In fact, I was there last week, didn’t notice. Thanks for pointing it out, Kevin. 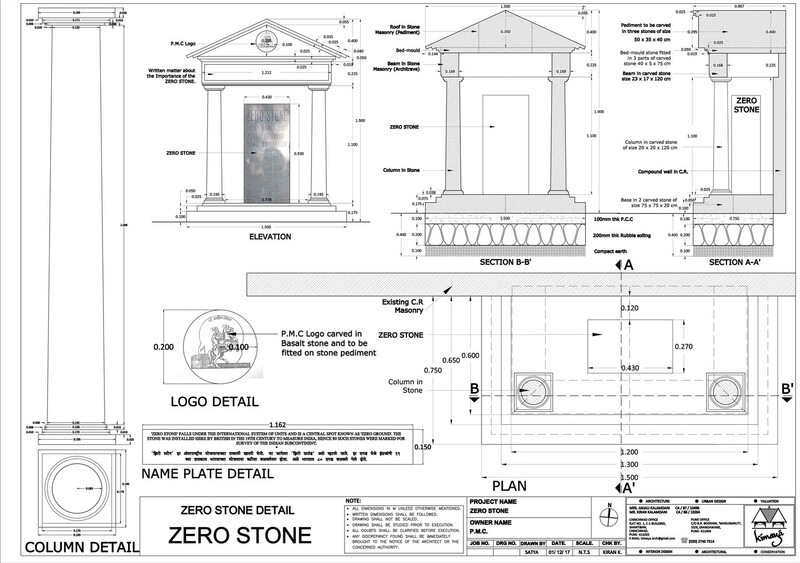 Ours is a firm of Conservation and Urban Design Consultants called Kimaya and we have voluntarily given the design of the protection scheme for the zero stone which will be ready shortly. This is fantastic news !! Is there any chance I could receive a copy of the design, possibly to include as an update to my post ? It would be good to show that there’s some attempts to change the current situation (credited to your firm of course). sending you the drawings and pictures on your email. Would you know anything of a similar such milestone in Mahabeleshwar?